The acoustic laptops work well as target objects in a workshop setting. The boxes in themselves are open to input, and I have had good experiences with people from various backgrounds - artistic, musical or neither, getting together and gather around them. 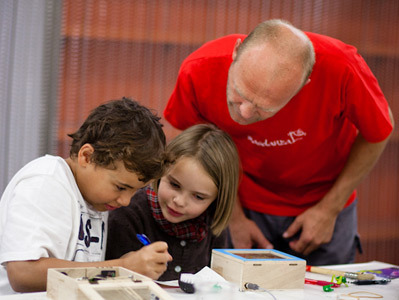 In a one or two sessions each workshop participant will create his/her own acoustic laptop to bring home. The friendly appearance and low-threshold "interface" of the boxes work as an equalizer regarding status or previous knowledge. 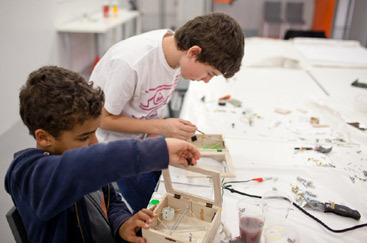 These workshops are not about "circuit-bending", where the focus is usually put on the technical aspects of building your own musical instrument. The tiny microphones needed will be quickly soldered and connected, leaving more time for selecting and testing of objects to put inside the box, exploring new depths of reality through sound. I always strive to create a comfort zone that in itself inspires creativity and reflection. This in turn leads to dynamic discussions and surprising lines of association. It is important to make each participant feel welcome and included, the workshop progress should be as democratic as these boxes are. There are certain aspects that can be tuned down, like the practical/technical issues (soldering, etc.) 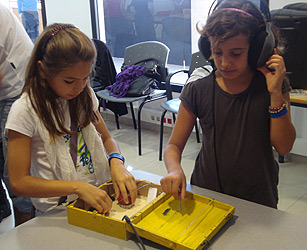 to allow more focus on sound exploration and the fun of making the boxes. Sometimes the children participate in groups, and parents are usually welcomed (to help out with the hot gluegun and such).